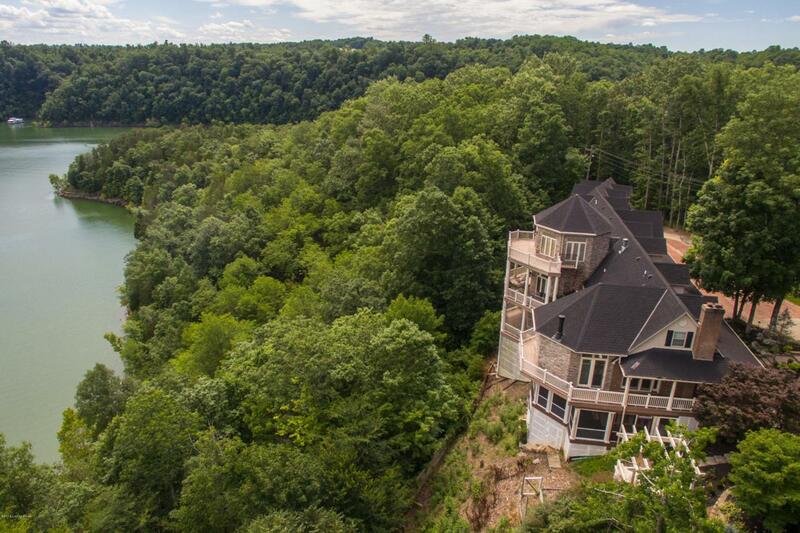 Located at the end of private street, perched on bluff overlooking panoramic views of Lake Cumberland and minutes from Jamestown Resort and Marina. Lake living at its finest with over 12,000 square feet of living space and four levels each offering unparalleled lake views. First floor of home offers welcoming foyer leading to library and kitchen that will excite the gourmet cook with custom built cabinetry, Sub-Zero refrigerator and oversized walk in pantry lined with storage and center island. Kitchen area flows into vaulted living room with floor to ceiling windows and stone fireplace. First floor master bedroom is truly luxurious with impressive crown moldings, trey ceilings and gorgeous chandeliers. Sitting room off master leads to private deck. Master bathroom suite offers jettedsoaking tub framed with barrel ceiling, custom mill work and private view of waters. Second floor offers additional two bedrooms and full bath. The lower walkout level is a mecca for family fun with room for pool table, large living area and second kitchen. Screened in porch with hot tub offers year round enjoyment with views of water and nature. Impressive, solid wood doors leads you to an outfitted, custom home theater with 123" screen, stadium style theater seating with full bar and wine cellar. Lower level master suite offers complete privacy with luxurious master bath and private deck. Home elevator accesses all levels of home including third floor tower. Additional guest suite accessed from attached heated garage. Garage offers five bays from front entrance of house with additional garage bay accessed from lower level wrap around drive. This extraordinary estate has been thoughtfully built and renovated with quality mechanicals, radiant heat and luxurious finishes with spaces to accommodate both large and small groups of guests for year round enjoyment. Professionally landscaped grounds lined with blooming perennials and water feature surround the home with outdoor fire pit and rare trail access leading to lake shore. This Lake Cumberland estate is truly a private oasis with the ultimate balance of nature and luxury to be cherished and enjoyed all four seasons. Call today for your private showing.